Easily create, beach-like waves with the BaByliss Wave Envy styler. If you have always had straight hair and envied those with an ideal wavy locks, then you’ve probably spent hours using traditional curling tongs and rollers. The Wave Envy takes the struggle out of this process. You simply press the hair between the ceramic plate and barrels to create a natural look. The technique is so quick and easy and the results are lasting. The Wave Envy styler gives you salon quality results at home. Its ceramic plate and barrels offer ultra fast heat up and heat recovery, meaning the desired temperature is maintained during use. With a top temperature of 200 degrees C, the results are lasting and the variable temperature control allows you to choose an ideal heat setting for your hair type. When the styler is switched on, an LED indicator will flash until the optimum temperature has been reached. When it stops flashing the styler is ready to go. To get an ideal results, divide dry hair into sections and comb through. Start by positioning the styler midway down each hair section, roughly around eye level. Take each section of hair and place it between the top barrels and bottom plate. Hold in place for a few seconds and then release the styler from the hair and gently slide down to the next section. Position the barrel over the last wave you created so you get an overlap - this will ensure you create a continuous wave effect in the hair. Slide the styler down the section of hair and repeat until the entire section has been styled. For voluminous waves, start by clamping the hair close to the roots, around the bottom section. As you start styling the top section, place the styler in the hair, at roughly eye level. To create a natural look, once you have styled all the hair take random sections from the top layer and clamp the hair slightly higher up the hair section. After styling, break up the waves with your fingers and add serum to the hair. Designed for every hair type, you can easily adjust the heat settings on the Wave Envy styler to one of three choices - 200 degrees C, 180 degrees C or 160 degrees C. Use the lower settings for fine or coloured hair. Or for thicker, coarser hair, use the higher settings, up to 200 degrees C.
The BaByliss Wave Envy styler has a long-length 2.5 m swivel cord for ease of use. For added safety, this styler also has an automatic shut off, meaning your styler will automatically switch off after 72 minutes. 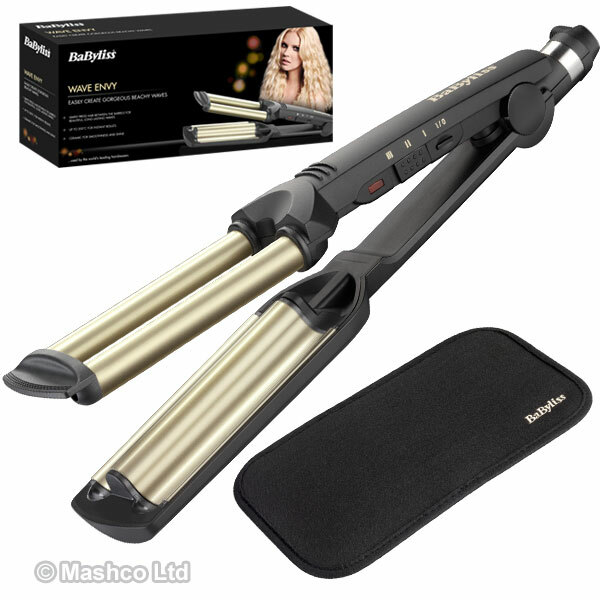 The heat proof mat included with the styler is ideal for protecting surfaces during styling. BaByliss is manufacturer of electrical personal care appliances from hair dryers, straighteners, tongs, hair clippers and trimmers, to beauty appliances and bath spas. BaByliss Products are used in hair and beauty salons and this expertise is used to create top performance products for use at home. All BaByliss products are thoroughly tested to give the ideal performance and results possible.